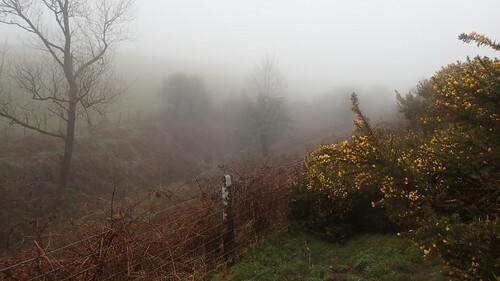 I parked near the bottom of Burrington Combe and close to the Burrington Inn, from a car park that’s frequently used by cavers and pot-holers. I was only slightly surprised to find just the one car beside my own. It was a day where I could have easily stayed indoors but, I didn’t want to ‘waste’ it, knowing I’d been back in work less than twenty-four hours later. 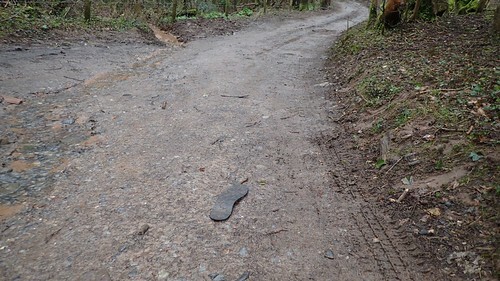 Similar to an equally wet post-snow walk I did in December, I began by hiking up Link Road, where I happened to find this discarded insole from someone’s shoe… Why only one? And would they have discarded a Superfeet insole quite so easily? 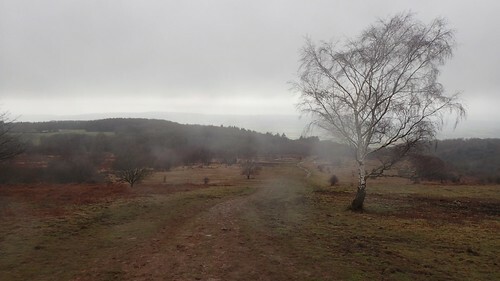 From there, I could begin climbing up on to the near-bleakness of Black Down. 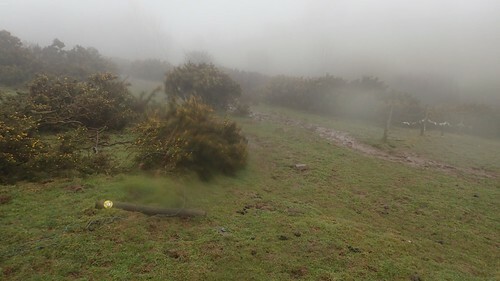 My route from here was again similar to that very wet day in December; climbing up the muddy hillside, destined for the ridge. Following in the line of West Twin Brook. 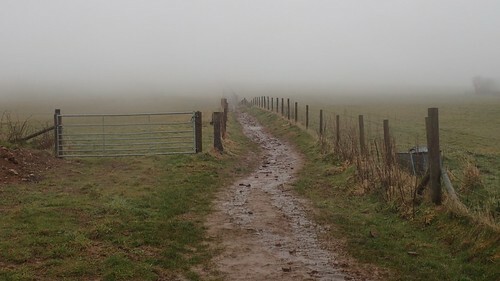 I was relieved to reach with bridleway. 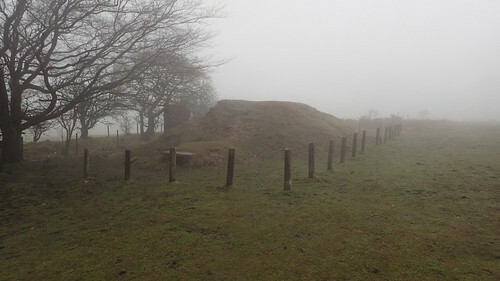 Easy walking, from here on, as the trig pillar on Beacon Batch soon emerged in to view. 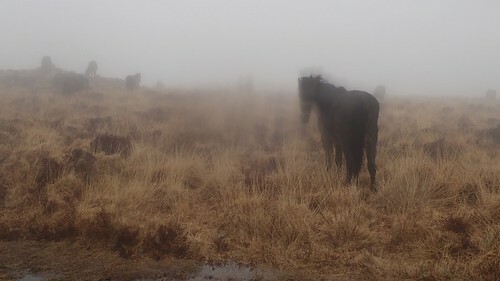 Of courses, they were horses! 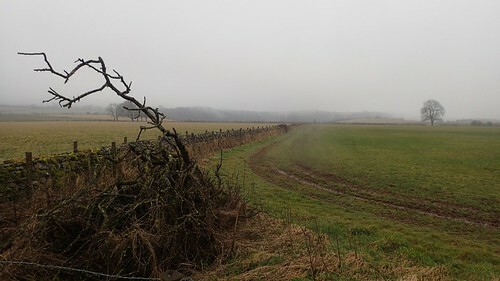 My walk continued in an eastward direction towards the wireless station – again, following the line of my previous walk. 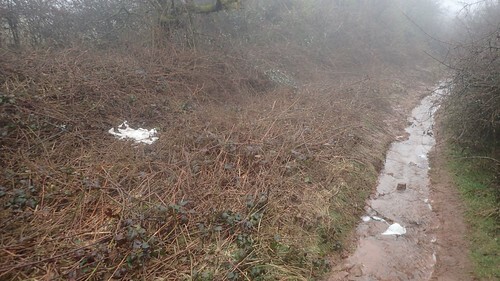 I even found what would be the only remnant of snow, which I think had fallen over the previous weekend. 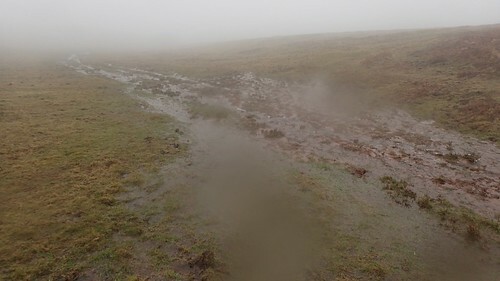 This track (read: stream) was again as waterlogged as on my last visit. When all that snow melts, it has to go somewhere! I would now walk south across a watery field, in the vague direction of Charterhouse. This was a path that I had never followed before. 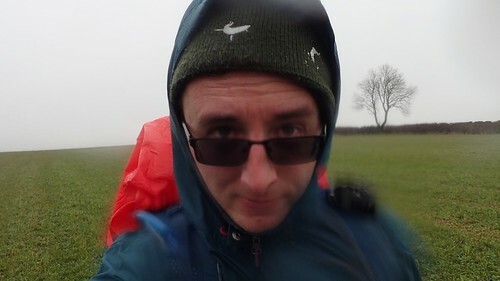 Even in the wet mist, I didn’t struggle for navigation. 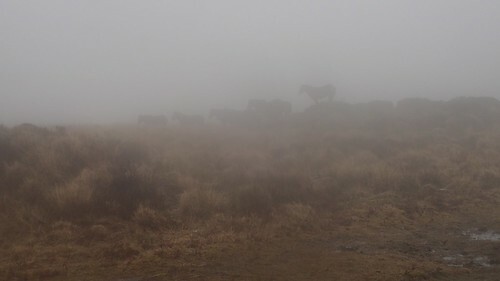 My only worry was that I might suddenly encounter a ghostly heard of cattle. But, that wasn’t to be the case. This path soon follows a shallow valley down to my right, on the western side, before eventually reaching a road. Approaching one stile, I encountered a sheep caught on the wrong side of the fence. I would’ve opened the gate for it, but for the fact it was in a greatly panicked state and struggling to climb the stile itself. A lamb would’ve jumped through with ease. 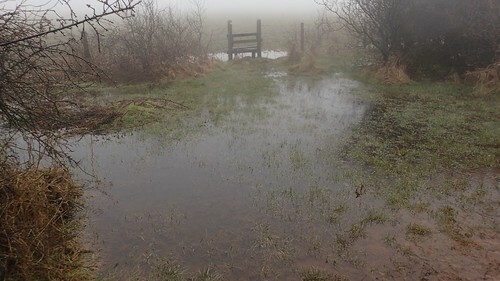 As I stood back to try and ease its own fear, it began to force itself through the stile… I only knew that it wasn’t going to fit and would likely get stuck. But, what could I do?! I must’ve watched it for a good ninety-seconds, as it appeared to keep forcing its way through while making not progress. Then, suddenly, an audible POP! It was as if I was watching a cartoon… The sheep had miraculously squeeze through and was off to join its flock! How did it get there in the first place? 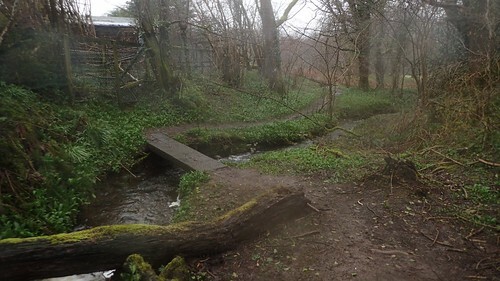 I crossed this next road to join a more familiar path on the other side, which continues to follow the same watercourse, initially. There used to be signs for a ‘tea shop’ to the left along here, in the back of what appears to be a private garden. But, with an absence of signs, I fear it may no longer be open for business. Emerging from the trees, I broke out on to the open fields. I found this lying on the ground… Someone with a more sensible mind has suggested it’s a headband. Of course, my first reaction was ‘underpants? 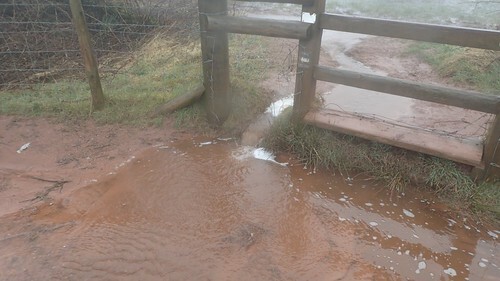 !’… I’ve seen groups of DofE walkers follow this path before. How many other people wear glasses? Do you have any tips for maintaining visibility while it’s raining? I’ve never found a baseball cap that fits my head and I have recently started wearing contact lenses for the first time in nine years. I’ve been thinking about a ‘rain repellent’ or hydrophobic spray (similar to what you can use on a car windscreen). I’ve noticed that Oakley do a Nanoclear Lens Cleaner Kit. while Nikwax do a Visor Proof product designed for motorbike helmets. If you’ve tried these or anything similar, I’d love to hear from you. 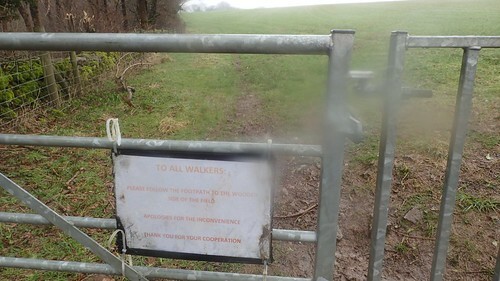 At the end of the next field, I found a sign on the gate, instructing walkers to ignore the public right of way that crosses the field and instead, to follow the boundary… I don’t know if a landowner can legally do this. I mean, it’s not like he’s illegally prohibiting access but, I don’t think they can redirect a non-permissive path at their leisure. 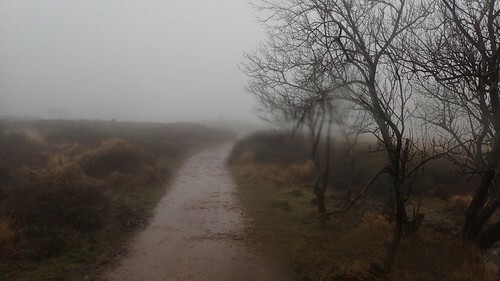 I was now descending towards Black Rock and Velvet Bottom near Cheddar Gorge. I really like this area but wouldn’t be visiting for very long, on this occasion. 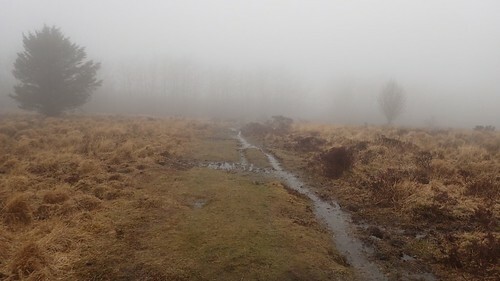 From this junction of paths, I would now follow the West Mendip Way, heading up through Long Wood towards Charterhouse Farm. 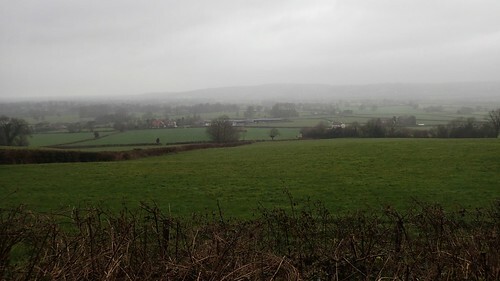 From here, I would leave the Mendip Way and continue west towards Ashridge Farm; now following another path that was new to me. 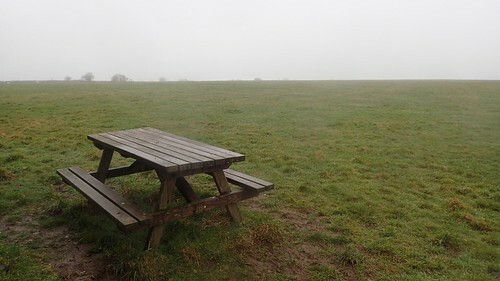 Aside from bundles of sheep along the way, there was nothing much to report… Until I found this picnic bench close to the wall of the final field! 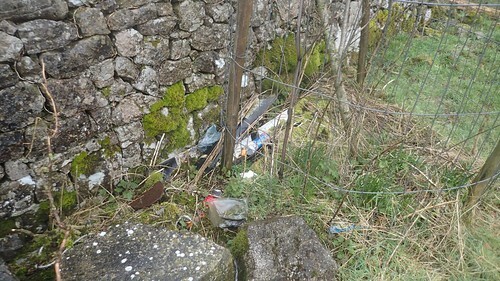 Some careless individuals had decided to use this bench and not properly dispose of their own waste. Through the farm gates and I was on to the road just south of Tynings Farm, from which the West Mendip Way passes through and down in to Rowberrow. 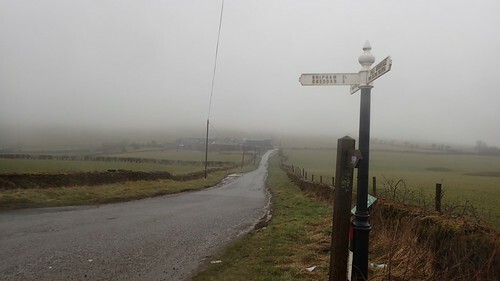 This is a popular way for road cyclists and I did see a pair of them, in spite of the overwhelming gloom. 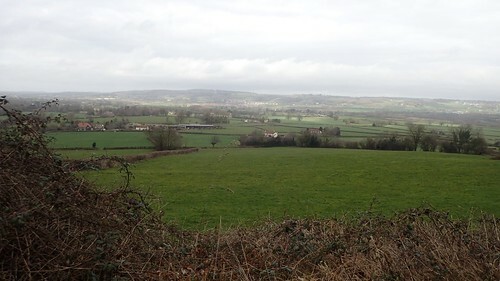 From the farm, I climbed north up a track on a return to Black Down. 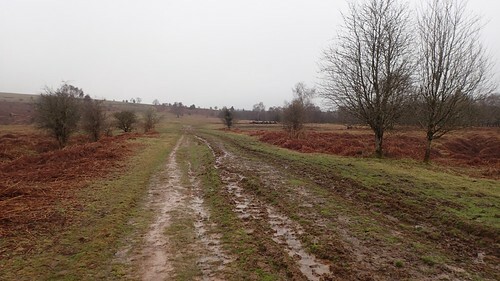 To my left, at the top of this track, was one of two remaining decoy bunkers, used as a form of defence during the Second World War, when this whole landscape was set alight to try and deter German bombers from reaching Bristol, just a few miles north of here. 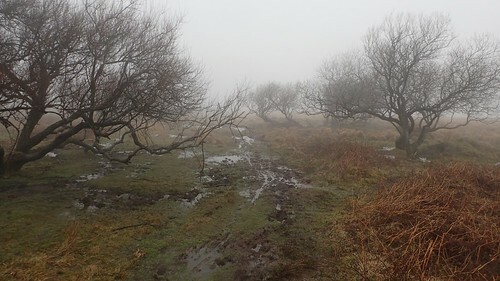 I was making my own way to Rowberrow, in a north-westward direction; following a path that is well used by horses but not well suited to many others, on a day like this. 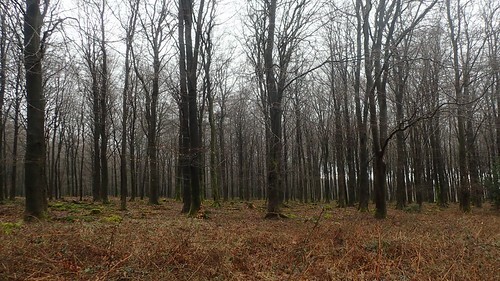 Trudging along the terrain, the tall trees of Rowberrow Warren soon emerged in to view. Beyond the fenceline, I knew that the paths in there would be much easier to walk along. 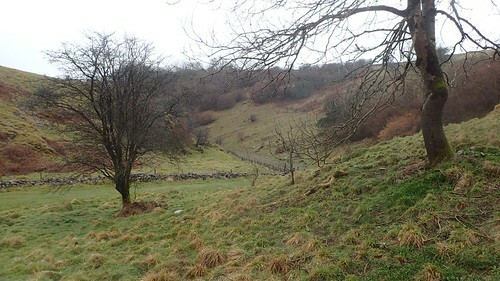 I walked northwards, heading downhill as far as a junction with the Limestone Link path. 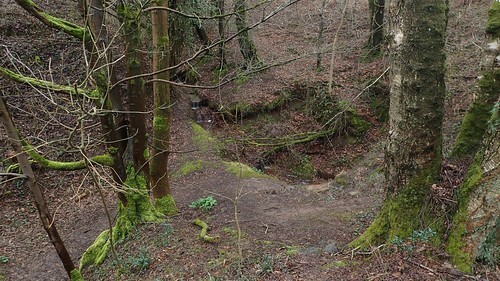 I would follow this to the east, beneath Mendip Lodge Wood and on to the north-western corner of Black Down, where I passed this shake hole that most likely provides access to Rod’s Pot or Bos Swallet. A stream of water runs down in to here. Retracing my outgoing route along Link Road, I noticed glimmers of light trying to break through the cloud. It wouldn’t end as a sunny day but the worst of the rain was now behind me, as I looked to head home just in time for lunch.